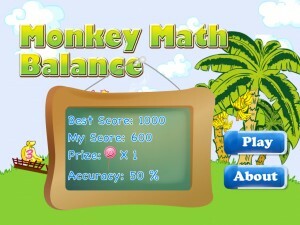 We recommend the Ipad that help children to learn addition and subtraction with interesting games: Monkey Math Balance. In the forest, there is a cute little monkey took a pile of bananas back, actually she doesn’t know the arithmetic, let your kid help the little monkey, make the seesaw balance! How to play: Drag the correct numbered banana from the ground into the basket, let the seesaw balance up! The little monkey will bring surprise to your kid. If do right, kid can get hearts and lollipops award. But if place the wrong number, little monkey will fall down due to she lose balance, so kid has to give help to the monkey. Game make learning fun, which let your kid easily do addition and subtraction practice. 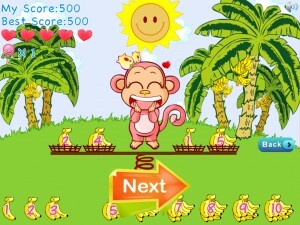 Game can help kid quickly master within 1-20 in addition and subtraction, achieving 100% accuracy. The game is equipped with score ranking feature that allows parents and children know the learning status. Well, if your children do right, little monkey can complete the mission. Upgrade version in the future will have various scenes in the stories, be worth to wait. You can follow us on Twitter:http://twitter.com/iAppsTea This game is suitable for ages 6 and up. 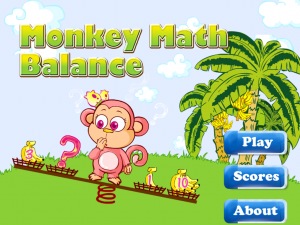 我们推荐的是一款ipad小朋友学习加减法的趣味游戏: Monkey Math Balance 在森林里,有只可爱的小猴子拿了一堆香蕉回来, 其实她不太懂算术,让您的小朋友帮帮小猴子,使翘翘板平衡起来吧! 玩法:拖动地上正确的数字香蕉放到篮子里,让翘翘板平衡起来!小猴子就会有惊喜带给您的小朋友. 做对了题目,有红心和波板糖奖励哦!! 但如果放错了数字香蕉,小猴子就会失去平衡,很容易跌倒的,小朋友你要好好帮助猴子啊!! 游戏寓教于乐,让您的小朋友轻松进行加减法运算练习. 游戏能帮助快速掌握1-20内的加减运算,做到百份百准确率,游戏配备分数排行榜功能,让小孩和家长知道学习情况。如果您的小朋友都做对了题目,小猴子就完成了任务使命啦,哈哈. 将来升级版还有不同场景故事呢,值得期待...你可以跟踪我们的新浪微博:http://t.sina.com.cn/kidapps,随时了解产品动态和分享给好友. This entry was posted on Thursday, February 24th, 2011 at 4:02 pm	and is filed under Apps, apps for kids. You can subscribe to any comments to this entry via RSS 2.0. You can leave a response, or trackback from your own site.